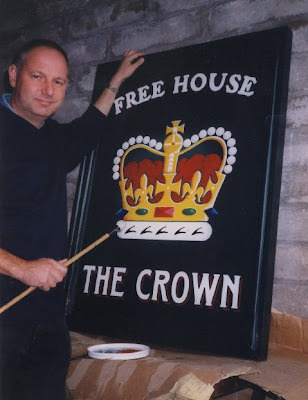 Talking to Lady Suzanne about my job as Local Artist / Sign maker of Oxfordshire, it struck me that one of the benefits of the Job is that I get to paint a great many Pub Signs and ergo get to go to a great many local Inns. Free Ale aside, this means I am never more than the breadth of a hair on my brush from one of my great joys of my life, history, and naturally, Inns and especially Inn Signs are a great indicator to the history of a local area. The use of the word arms in pub names is so wide spread in England, because inns used to display the coat of arms of the nearest bigwig under whose protection it operated. This was not so much for identifying the pub but as a warning to brigands that raiding the place would bring the posse down on their heads. During times of warring it wasn't only customers who switched allegiance. Pubs too often hurriedly changed names for political reasons. The heraldic sign of Richard the Third was a white boar, which lead to countless White Boar Inns springing up. "Shilling " coins issued at the time also displayed the creature. Nicknamed a "Hog" the shilling bought a whole raft of ale, hence "going the whole hog". 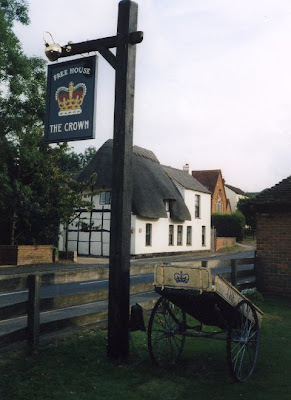 But after Richard's defeat at the battle of Bosworth Field, landlords were contacting Sign makers to get out the tins of blue paint to change their signs to the coat of arms of the victorious Earl of Oxford, hence the prevalence of Blue Boar Inns. A simpler route was often to call the Inn, The Crown, and this would cover any King or Queen who got into power. In those days a knight was worth more alive than dead. Once captured, he could be ransomed back to his King or to his estate. While the price of his return was being haggled over, the knight was given living quarters in the best inns, befitting his station. Through his practice, the showing of mercy came to be known as "granting quarter(s) ". 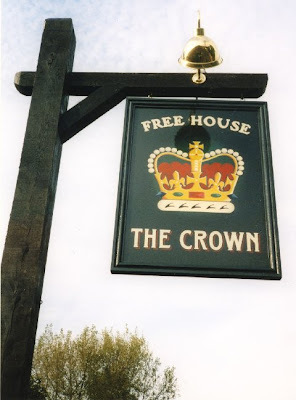 Now I can tell already before I have even posted this blog that Sir Hook and Sir Bowie will be drooling into their moustaches at the sight of a sign that proclaims; FREE HOUSE. well sorry to disappoint you boys... this just means that the Inn is not owned by a brewery, and the landlord is free to serve whatever choice ales he thinks his customers will relish,....The Ale is NOT free, so put the passports back in the draw. Still its nice to know, that the next time I get out my trusty mahl stick, and tins of enamel, that I can proudly claim to be a member of the Peace-keeping forces in the UK. I'll drink to that.! Perhaps will all the FREE PUBLICITY the Inn is now receiving on the premier world-wide Moleskine, Spirit, Ale, and Travel blog the owner will make a "Free Ale" exception?